Be confident in the health of your business. RWA is the UK’s leading provider of regulatory compliance services in the general insurance sector. Our approach is to work with clients to fully understand their business and structure support which not only helps them meet regulatory obligations but also serves to enhance their overall operation. Our consultants work tirelessly to align activities to each client’s needs and deliver our market-leading health check service with minimal disruption, either onsite or remotely depending on each client’s preference. RWA offers full UK coverage; our team of experienced business managers work with clients to build lasting relations that deliver clear results. Compliance is an ever-changing landscape of new regulations, processes and procedures, which is why continuity of support is important for both our clients and RWA. 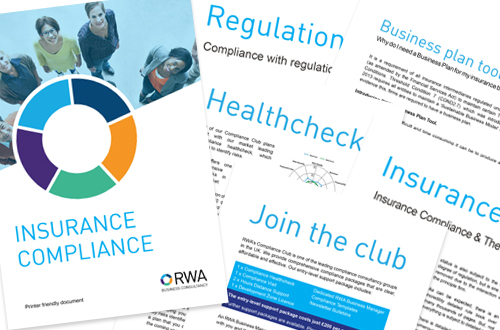 If you would like to learn more about RWA's insurance compliance services, please download our brochure.